You may have heard someone say that a turkey is so dumb it will drown itself in a rainstorm by holding its head up, watching the rain. You may have just heard someone say that a turkey is plain stupid. I am here to assure you that both statements were obviously said by someone who has never owned a turkey. 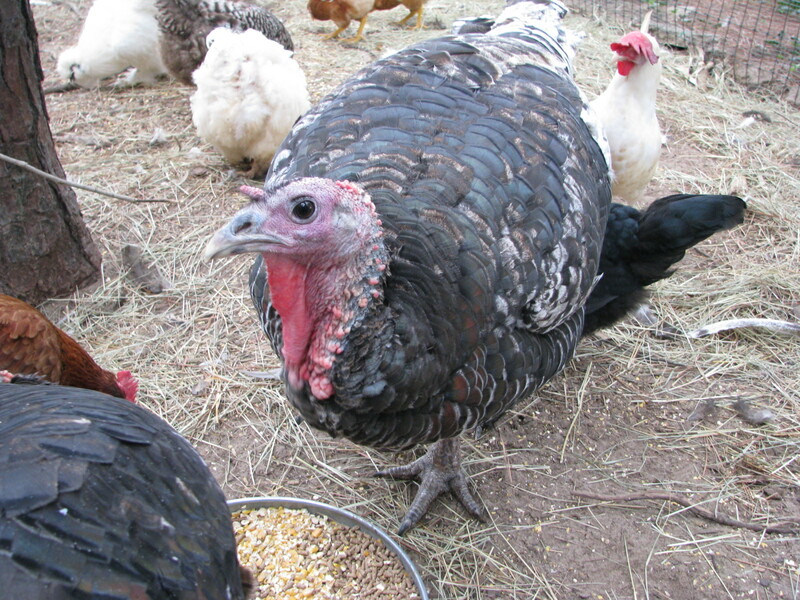 I bought my pair of Broad Breasted Bronze turkeys in March of ’09. They were supposed to be slaughtered at about 6 months of age. Well, that was the plan anyway. After so many excuses, it eventually just became a joke about killing (or the non-killing of) the turkeys. The truth was, we had grown pretty fond of the fat birds. They are amazingly dog-like, and would follow you just to plop down right in front of your feet and occasionally the golf cart while in motion. My hen would lay down in front of me and let us all pet her as long as we wished. Tom was more standoffish, that is, until you brought out the feed cup and he suddenly became your best friend, waddling as fast as he possibly could to try and snag some food. I had taught them how to drink from a chick waterer (using beer caps), how to eat (using Mardi Gras beads), and where to stay at night. We shared a year together, until today. Today I went out to the coop to find that Hen had prolapsed overnight. To spare you the grisly details, think: insides on your outsides. And, it was a complete mess. 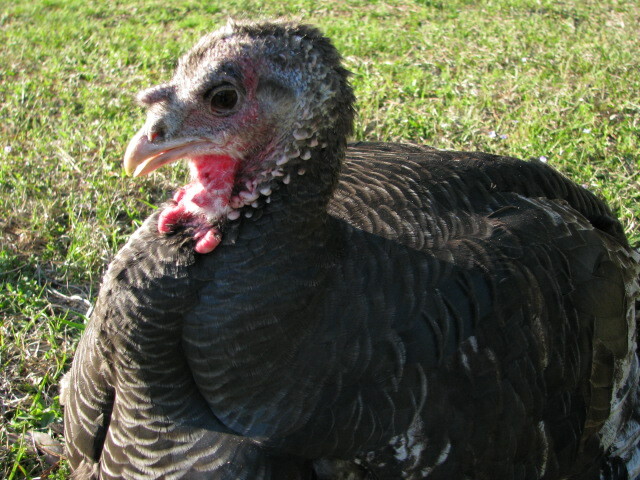 Broad Breasted turkeys are not bred for longetivity. They are bred to put on weight as fast as possible in the least amount of time. They are almost always propagated, if you will, by artificial insemination, as they are so heavy they can’t ‘do it’ naturally. Tom had already had leg trouble, but seemed to have gotten over it for the most part. But now, here was a problem that definitely couldn’t be fixed, nor ignored. I knew it was time to stop joking about killing the turkeys and time to actually do it. Tom last fall in the coop. I have never butchered an animal, ever. But, keeping with my pioneer spirit, I knew that today would be THE DAY. Trust me, I wasn’t excited about it. So, after lunch, I got my filet knife, Jason got his .22 and we got Hen from the coop. I wasn’t as sad as I thought I would be because I knew she was in pain. Jason shot her and let me tell you that a bird still moves around…a LOT. In fact, to the point it is dangerous should you get too close. But we managed to rope the legs and we suspended her from a plank, much like you would suspend other large game. I did have to slit the neck (you let them ‘bleed out’), which was not quite as bad as I thought. After a few minutes, I plucked the feathers from the breast and inside of the legs as fast as I could (birds have a HUGE amount of feathers, by the way). Then, I took my knife and sliced the skin straight down the keel bone. Then I cut out the breast muscles. You would think this would be really bloody. It is not. It is actually a very clean process. I also skinned the drumstick (huge) and took them off of the bird via some shears. All in all, the whole process took about 15 minutes or so. Yes, we repeated the process with Tom. Yes, I did cry, especially after my daughter said, “But, I LIKE Tom.” I ‘talked’ to him, for the last time, in my best ‘Turkey-ese” (I have gotten pretty good at imitating a turkey now), and I walked away because I couldn’t bear to see him get shot. And then he did, and then I repeated the whole butchering process over again, amidst several tears. And now, Tom and Hen are in my refrigerator awaiting some seasoning and their futures as sausage patties. I want to know where my food comes from. This is why we made the decision to grow and process our own food. I know that Tom and Hen had great lives, far better than their Butterball cousins who are packed, by the thousands, in windowless, disgusting buildings. Tom and Hen knew what sunshine was, and fresh grass, and bugs, and what being loved by humans was like. 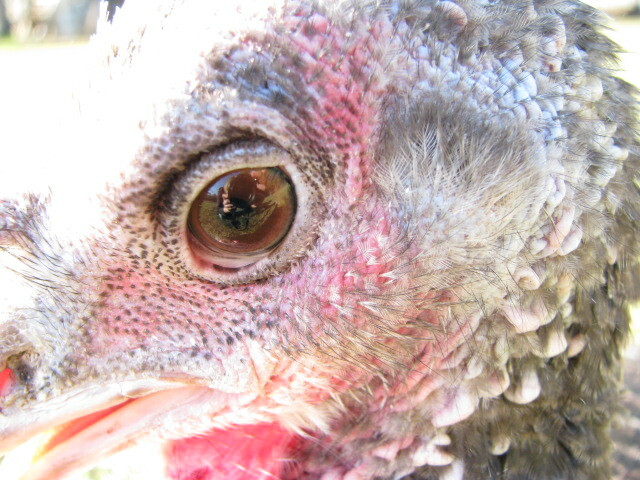 Every time we eat a chicken or a cow or a turkey who was raised in some industrial hellhole, we are supporting that. For every McNugget your kids eat and every fast food burger that you eat, you are supporting that way of life. I have chosen not to support that any more. I loved Tom and Hen, but I knew what their future would be. I have no interest in becoming a full fledged vegetarian, so I choose to raise my own meat humanely until the end. An ode to a turkey. They will never be forgotten. Wow, I never knew you felt this way about it Amanda.. I’ve always known you loved animals, but it’s interesting and inspiring to read about your experiences–joyful or traumatic though they may be–with raising your food beginning to end. I really admire you and this choice you’ve made. It’s definitely going to have an effect on the food decisions I make now! love you…. Thanks! I think it is so important to know where your food comes from…I have become a total zealot about the whole food thing. In fact, just today I planted almost 30 tomato plants! I love the animals here, and they are so interesting. While I am not crazy about butchering, the reality of the situation is that I like to eat meat, so I may as well raise what I’m going to eat instead of relying on industrial giants who are extremely cruel to the animals and don’t care about their well-being.